In this paper I have found the magnetic field strength of a neutron star, by using flux conservation, which the size of the sun as a progenitor star and its magnitude is Bη=9 × 1014 G which is approximately quadruple of magnetic field of the sun. The dying star collapses to form a neutron star, magnetic flux conservation results in the formation of regions of extremely strong magnetic field near the neutron star. This shows a neutron star is strongly magnetized at birth. This kind of neutron star is called a pulsar and it is supposed radiator. The rotation period of a neutron star is calculated using angular momentum conservation and the result led that, the rotation period of neutron star is τηs ∼ 0.1 s. The sun rotates once every 107 seconds; this implies that a typical neutron star with radius 10 km rotates 108 times faster than the size of our sun with radius 105 km. So a typical neutron star is a pulsar. I have derived the field lines corresponding to a magnetic octupole moment. 2D case-section of the field lines of a neutron star is drawn. The magnetic field of a neutron star is derived from flux conservation and is high during the age of its birth. The octupole magnetic field of a neutron star is maximum at the surface and ceases to zero in the far distant zone, but visible as pair lobes looks like dipole. Finally, the octupole field strength is dominated at the surface than the dipole field, this leads to Neutron stars octupole field near the center is more significant. The radiation from such a source is calculated and is shown to be diffuse. The radiation pressure generated from octupole field lines of neutron star is calculated and the pressure dominates at the surface and rapidly drops it in the far zone. This result leads to violate the known electromagnetic radiation in the far zone is not vanish rapidly. So, this is the neutron star’s unique property, with evidence supported by two rotating axis than other stars with one rotating axis. In 1934 Walter Baade and Fritz Zwicky proposed the existence of neutron stars, only a year after the discovery of the neutron by Sir James Chadwick. In seeking an explanation for the origin of a supernova, they proposed that the neutron star is formed in a supernova explosion. Neutron stars are about 20 km in diameter and have a mass of about 1.4 times that of our Sun. This means that a neutron star is so dense that on Earth, one teaspoonful would weigh a billion tons [1-3]. Because of its small size and high density, a neutron star possesses a surface gravitational field about 2 × 1011 times that of Earth. Neutron stars can also carry magnetic fields a million times stronger than the strongest magnetic fields produced on Earth. Neutron stars are one of the possible end states for a massive star. They result from massive stars which have mass greater than 6-8 times that of our Sun. After these stars have finished burning their nuclear fuel, they undergo a supernova explosion. This explosion blows off the outer layers of a star into a beautiful super- nova remnant. The central region of the star collapses under gravity. It collapses so much that proton and electron combine to form neutrons [1-3]. A neutron star also has two axes: a magnetic one and an axis of rotation. Besides emitting radio waves, a neutron star also emits intense X-rays and γ-rays as well. In fact, Neutron stars emit some of the strongest X-rays in our galaxy. Neutron stars are strongly magnetized fast rotating objects. As a result a neutron star can generate immensely huge potential differences. This helps neutron stars pulse strong radiation from its two poles. Also, along with rotation, the magnetic field can produce potential differences of trillions of volts [1,4]. Electromagnetic radiation is made up of electric and magnetic fields that oscillate at right angles to each other. EM radiation moves at a speed of light c. The Poynting vector S is defined as to be equal to the cross product . where μ0, is the permeability of the medium through which the radiation passes, E is the amplitude of the electric field, and B is the amplitude of the magnetic field. Applying the definition of cross product and the knowledge that the electric and magnetic fields are perpendicular to each other gives the magnitude S of the Poynting vector as . where E and B are, respectively, the magnitudes of the vectors E and B. There is electric and magnetic multi-pole radiation of all order. Here is our attention is focused on specially octupole magnetic radiation. The pressure pushing outwards from the centre of an ordinary star because of the energy generated at the stars core counterbalances the gravitational forces due to the stars mass which tend to make it contract. When the stars energy production ceases and the radiation pressure is removed, the star will start to collapse [5-7]. 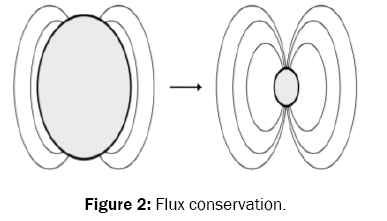 These special characteristics of neutron star from other ordinary star makes our attention to study and measure the magnetic field strength, its field lines emanating from its centre and the radiation pressure from its octupole fields, especially, the obliquely rotating magnetic moment (Figure 1) . 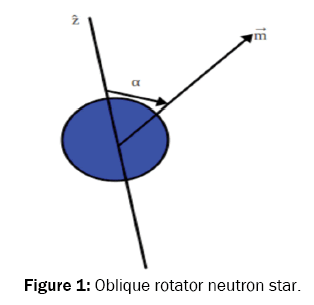 Figure 1: Oblique rotator neutron star. In this paper we have used analytical method to get the geometry of octupole filed lines and to derive the magnetic flux of a neutron star. In some analytical purposes, we have used Wolfram Mathematica software to simplify tricky trigonometric equations.I have used python 2.7 and matplotlib to plot and interpret our data. The magnetization vector associated with this magnetic field is usually an oblique rotator. Since m is oblique the vector potential is rotated at any field is sinusoidal and hence time. This kind of neutron star is called a pulsar and it is supposed radiator. 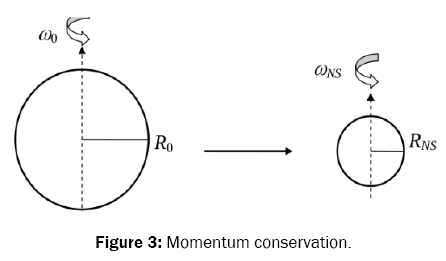 A rotating object has angular momentum L, given by L=Iω where I is the moment of inertia and ω is the angular velocity. ω is the angle in radians through which an object rotates per unit time. 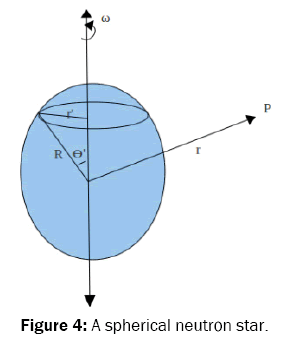 If the rotation period is τ then . Suppose the core of a typical dying star has a radius of ∼105 km and rotates once every ∼100 days i.e. ∼107 s. Then after collapsing to a neutron star of radius ∼10 km it will have a rotation period of τηs ∼ 0.1 s. So we have an object of about the mass of the Sun, rotating 10 times every second (Figure 3). Consider a charge Q uniformly distributed over a surface of spherical neutron star of radius R. Assume that a neutron star is spinning with a frequency of ω about its diameter (Figures 4 and 5). We would like to calculate the magnetic field generated by the spinning charge at external to the body of the neutron star (Table 1). Figure 4: A spherical neutron star. Figure 5: Radial and polar components of magnetic field of neutron star. Table 1: The value of octupole and dipole magnetic field strength. where is the Octupole moment. Following the same fashion for the octupole magnetic field, to be show as follows. A magnetic field is a field of force produced by moving electric charges or by electric fields that vary in time. The magnetic field at any given point is specified by both direction and magnitude (Figures 6 and 7). The relationship between the magnetic and electric fields, and the currents and charges that create them, is described by a set of four so called Maxwell’s equations. Figure 6: The geometry of field lines for the octupole magnetic moment for KO=n where n is positive integer. 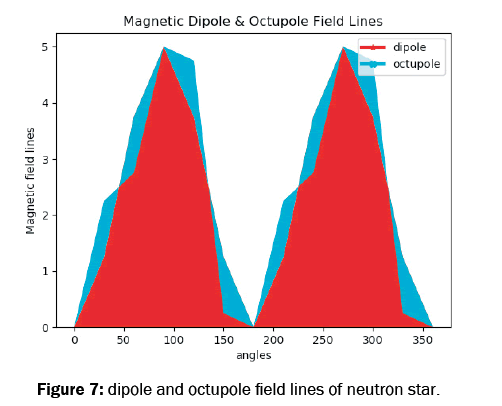 Figure 7: Dipole and octupole field lines of neutron star. This equation is the general field line equation for the magnetic octupole field as a function of ϑ. This is the radiation pressure in the radial direction. In this paper I have found the magnetic field strength of a neutron star, by using flux conservation, which the size of the sun as a progenitor star and its magnitude is Bη=9 × 1014 G which is approximately quadruple of magnetic field of the sun [9-11]. The dying star collapses to form a neutron star, the magnetic flux conservation results in formation of the regions of extremely strong magnetic field near the neutron star. This shows a neutron star is strongly magnetized at birth. This kind of neutron star is called a pulsar and it is supposed radiator. The rotation period of a neutron star is calculated using angular momentum conservation and the result led that, the rotation period of neutron star is τηs ∼ 0.1 s. The sun rotates once every 107 s, this implies that a typical neutron star with radius 10 km rotates 108 times faster than the size of our sun with radius 105 km. So a typical neutron star is a pulsar [12-15]. I have derived the expression for the octupole magnetic field starting from the vector potential A. A multipole expansion of A, led in to the expression for the octupole field, and it is dominated at the surface and decreases rapidly in the far distance as shown in Figure 5. The quadrupole magnetic field strength of a neutron star should lie between the dipole and octupole fields . This is in contrary to the electromagnetic radiations emitted by other stars [17-20]. The field lines from these magnetic field is calculated and shown that the field lines form eight loops with an angular span of 2π as shown in Figure 6. Finally, I have derived the radiation of this component to show that its pressure is radial having inverse distance square dependence. The radiation pressure from a neutron star varies as the 8th power of the frequency for octupole fields [21,22]. As shown in Figure 8, the octupole radiation is high near the surface of a neutron star for both X-ray and γ-ray frequencies. Since the radiation pressure of a neutron star is derived from retarded vector potential expansion, electromagnetic potentials and fields are assumed to have the same time dependence . So it is gauge invariance (Table 2). 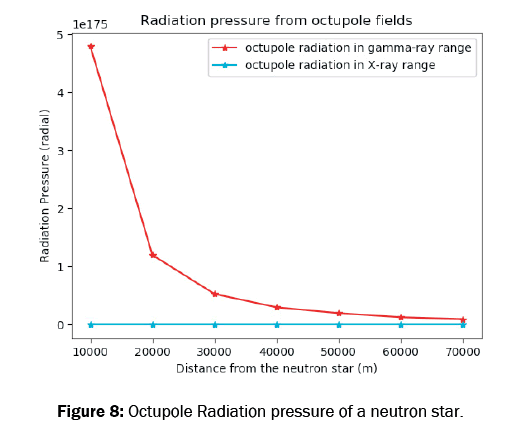 Figure 8: Octupole Radiation pressure of a neutron star. Table 2: Radiation pressure from octupole field in γ and X rays range. In the future we will consider 3D octupole field lines and magnetic field strength of a neutron star. I would like to express my gratitude to all those who gave me encouragement and support to complete this research, especially, the late died scientist Dr Legesse Wetro, his supporting ideas are high in this research (R.I.P.) I would like to say also thanks Dr Abraham Amaha for his valuable comments. Camenzind M. Compact Objects in Astrophysics, White Dwarfs, Neutron Stars and Black Holes. Springer Verlag Berlin Heidelberg, New York. ISSN 0941-7834, 2007;187-303. Akira-Ishimaru. Electromagnetic wave propagation, radiation, and scattering. Prentice Hall, Inc, 1991. Holt CA. Introduction to Electromagnetic Fields and Waves. (4thedn), United States of America, 1967. Ida-Joao N and Bastos PA. Electromagnetics and Calculation of Fields. (2ndedn), pringer-Verlag New York, Inc., 1997. Lorrain P. Electromagnetic Fields and Waves Including Electric Circuits. (3rdedn), W. H. Freeman and Company, 1988. Haus HA and Melcher JR. Electromagnetic Fields and Energy. Prentice Hall, 1989. Taylor RJ. The stars: their structure and evolution. Springer-verlag new york inc, 1970. Collins GW. The Fundamentals of Stellar Astrophysics. Case Western Reserve University, 2003. Taylor and Francis Group, LLC. Particle and Astroparticle Physics: Series in High Energy Physics, Cosmology, and Gravitation, 2008. Weekes T. Very High Energy Gamma-Ray Astronomy. Institute of Physics Publishing, London, 2003. Moore P. Practical Astronomy Series. Springer-Verlag London Ltd., 2003. Perkins DH. Particle Astroparticle Physics. Oxford University Press Inc. New York, 2003. Salaris M and Cassisi S. Evolution of Stars and Stellar Populations. John Wiley and Sons, 2005. Narlikar JV. An Introduction to Relativity. Cambridge University Press, 2010. John David Jackson. Classical electrodynamics. (3rdedn), John Wiley and Sons, Inc, 2001. Icko Iben Jr. Advanced Evolution of Single Stars. Cambridge University Press, 2013;2. Fayyazuddin and Riazuddin. A Modern Introduction to Particle Physics. (2ndedn), World Scientific Publishing Co. Pte. Ltd, 2000. Van Putten MH. Gravitational radiation, luminous black holes and Gamma-Ray burst supernovae. Cambridge University Press, 2005. Felix J. Elements of High Energy Physics. 2004;1-131. Choudhuri AR. Astrophysics for physicists. Cambridge university press, 2010. Becker W. X-ray emission from pulsars and neutron stars. In Neutron stars and pulsars. Springer, Berlin, Heidelberg, 2009;91-140. Haensel P, et al. Neutron Stars 1: Astrophysics and space science library. Springer Science+ Business Media, LLC, 2007;326. Schulz NS. The Formation and Early Evolution of Stars. The Formation and Early Evolution of Stars: From Dust to Stars and Planets, Astronomy and Astrophysics Library. Springer-Verlag Berlin Heidelberg, 2012;978-3-642-23925-0.